Writer/director Charlie McDowell follows up his heady, sci-fi romance drama The One I Love with another film that seems to fit neatly into that very same category. The difference with The Discovery lies in its tantalizing, elevator pitch of a premise: what would happen in a world where the existence of an afterlife was proven scientifically and considered as absolute as gravity? The answer to that question and the multitude of implications that it generates makes for a solid foundation of intrigue as this story’s jumping-off point but McDowell seems to get too lost inside the plot’s machinations to give us any satisfying conclusions to its queries. The man responsible for the titular revelation is Dr. Thomas Harbor (Robert Redford), who opens the film by giving a television interview about the enormous impact that his scientific finding has had on a global scale. When asked if he feels even partially guilty for the large uptick in suicides that seem to have been spurred on by the new found guarantee of life after death, he argues that keeping such a discovery from the human race would be more criminal than divulging it. His principled stand on the subject finds a formidable counterpoint by way of a cameraman’s suicide caught live on the air, making Harbor’s stance seem even more calloused than it had before. 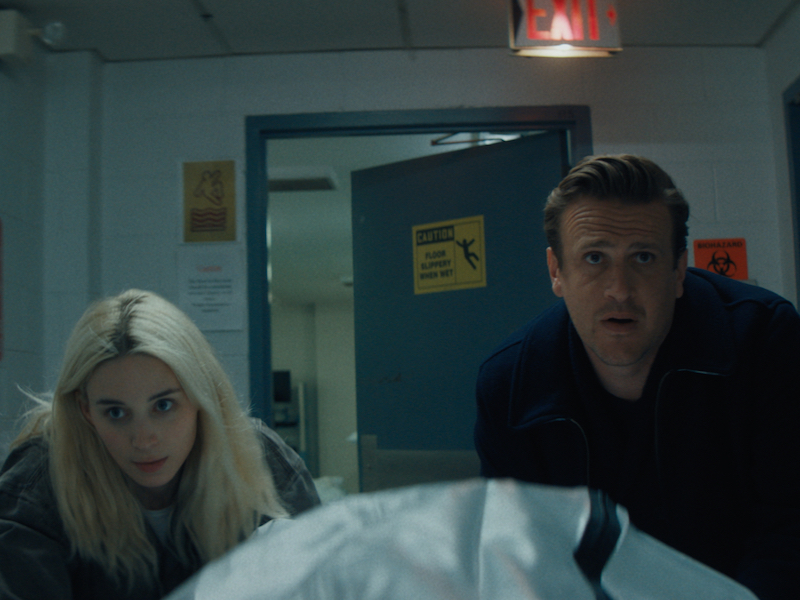 Also opposed to Harbor’s approach is his estranged son Will (Jason Segal), who journeys to his father’s estate two years after the discovery to dissuade him from further investigating his afterlife findings. On the ferry trip there, he meets the quirky but disturbed Isla (Rooney Mara) who is secretly planning to commit suicide once she reaches her destination on the island. After Will witnesses her attempt and intervenes, the two join Dr. Harbor and his other son Toby (Jesse Plemons) on their compound as they try to decode the mysteries behind Harbor’s research and prevent any further damage to society. McDowell has drawn comparisons to Charlie Kaufman before but here, the similarities to Eternal Sunshine of the Spotless Mind are a bit too close for comfort, especially in the way that both films introduce their central couples. A key difference is that The Discovery‘s examination of Will and Isla’s relationship is much more cursory by comparison, though it is rare to find a film with a more complete portrait of a romantic relationship than that Michel Gondry masterpiece. Still, it’s disappointing that the screenplay doesn’t spend as much time fleshing out a believeable chemistry between these two as it does positing philosophical quandaries to mentally digest. Even if the blend of science fiction and melodrama doesn’t quite work in this instance, McDowell and his team do an excellent job of building a bleak world run amok with hopelessness and a quiet devestation that permeates every frame. Without a spiritual anchor and a meaningful way to guide the ship, every character in the story is essentially lost at sea and constantly searching for something new to grasp. If The Discovery had followed through with the promise of its premise, I have no doubt that it could have been a lasting achievement in existential sci-fi but with all of the other distracting elements in play, it’s a frustrating but admirable effort.